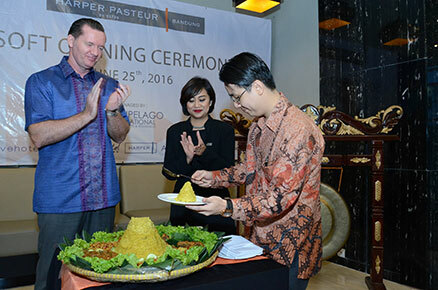 Jakarta, 30th June 2016 – As the latest addition to the Harper family, Archipelago International, Indonesia’s largest hotel management chain, proudly introduced its newest hotel to Bandung, with the opening of Harper Pasteur last week on June 25th, 2016. Gearing up to welcome guests to the gateway of Bandung, Harper Pasteur is set to become a one-stop holiday destination in the city, surrounded by cultural sites and entertainment hotspots. Located close to the famous Rumah Mode, Cihampelas Shopping Center and Paris Van Java Shopping Mall, Harper Pasteur also offers easy access to the city's cultural and historical sites, such as Museum Geologi, Museum Asia Afrika, and Gedung Sate. The hotel also provides breathtaking views of the Bandung skyline from the hotel’s topmost floor and impressive venue, the Kahyangan Lounge. Besides being a haven for leisure travelers, Harper Pasteur is also designed for business travelers with nine spacious meeting rooms and the Majapahit Ballroom, which can be used for both celebratory and formal occasions. Harper Pasteur is also located close to the Husein Sastranegara Airport, Bandung Railway Station, and Pasteur Toll Gate, allowing easy access to and from the hotel. To honor the opening of Harper Pasteur, Archipelago International held a Photo Contest on Instagram to introduce the public to the beauty of Bandung. The theme of the photo contest was therefore centered around Bandung's natural landscapes, and as such, the competition hashtags, #extraordinarybandung, #harperpasteur, #harperhotels and #liveextraordinary, generated hundreds of photo uploads of the city's sights between the 20thand 23rd June 2016. The three lucky winners are @reizielhd, @usepusman and @yoffi_s_sjachriar. During the soft opening event, they received a special gift from Harper Pasteur. "Our Harper Brand is extremely unique to Indonesia because it offers a truly residential feel with balanced functionality, unobtrusive service and never ending innovation - ideal for the astute traveler who values individualism and character. Currently we manage three Harper Hotels in Bali, Yogyakarta, and Purwakarta, and we chose Bandung to become our fourth location thanks to its dazzling panoramic views and charming culture and history. We hope that the new Harper Pasteur will help to raise awareness and interest for Bandung to become a premier destination in the future,” said John Flood, President and CEO of Archipelago International.